It’s been a while friends, I’ve been back east spending time with my family and celebrating my sister as she recently got married. Many of you probably saw the million desserts and some pictures of her special day. Besides my own wedding (coming up on 13 years ago) this was one of the most special days of my life. My sister is my everything! She is my other half and seeing her so happy made me happy. But, after a month away from my own home, it was time to get back and into my normal routine. As the start of school is upon us and I have ALL 3 of my kiddos in school full-time, I hope to spend more time with all of you creating recipes and sharing with you. So here we are, beginning of September and for some bizarre reason unknown to me it’s 100 degrees in Portland!?!?! Yes, you heard that right, Portland, OR is 100 degrees in SEPTEMBER! What is wrong with this picture???? While it feels like summer (like really feels like it) I thought bringing in some peaches to a dessert was very appropriate. Despite the fact it reached about 90 degrees today, I was not afraid to turn the oven on. We also just got central air this year so I’m living large!!!! One of my nearest and dearest friends invited the family to dinner and her request, every time is dessert. I guess that’s my thing. I thought about peach cobbler but was in the mood for something a little less American and a little more decadent. Why not a tart?? 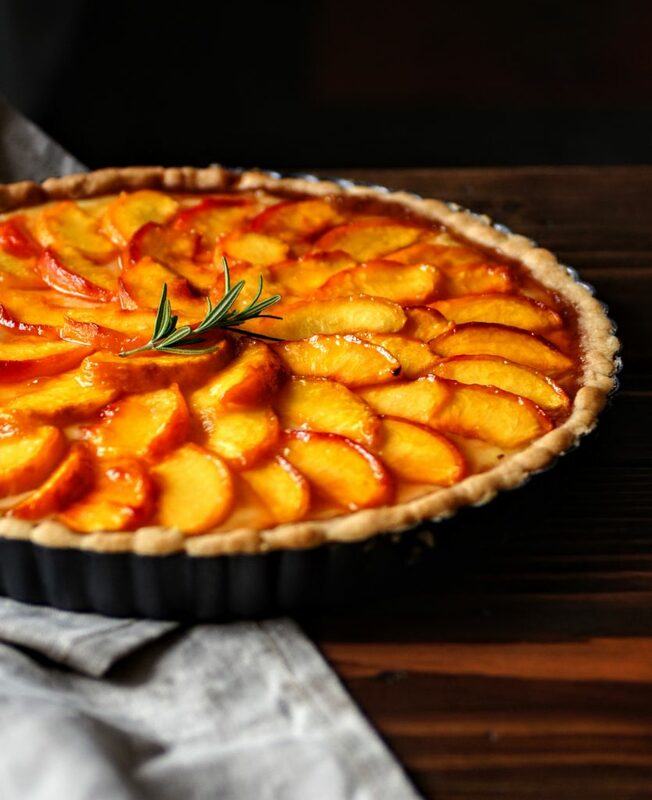 Delicious crust, pastry cream and topped with luscious peaches, what’s not to love! Winner Winner!! Even though there are several steps to assemble the tart, it comes together quite quickly. You’ll first want to score and blanch your peaches very quickly to remove the skins. The pastry dough is made up of sugar, flour and butter…yeah, a little bit of heaven! The brown sugar gives it a hint of caramel flavor which I am a sucker for! And pastry cream, is there anything better? Who would have thought that eggs bring such joy in sweet treats. The custard is so luscious, I have a hard time not taking a huge spoonful! After some bake time, fridge time and bake time again, you’ll have your special dessert to enjoy! Follow the detailed instructions below. This is a perfect dessert for a dinner party, it’s lovely on it’s own, doesn’t need any accompaniments and tastes AMAZING! You will make your guests swoon and begging for more. Not to mention it is very photogenic! I hope you enjoy this special treat. I would love to see your creations! Tag me on Instagram @CosettesKitchen or post on my Facebook Page. This tart is amazingly decadent! Enjoy!! Preheat oven to 375 degrees F. Lightly butter a round tart pan. Using a sharp knife, cut a shallow "X" on the bottom of each peach. Add the peaches to the pot and allow to boil for 1-4 minutes. Peaches that are riper won't need quite as long, while firmer peaches could stay in a bit longer. You'll start to see the skin pull back after a few minutes. Remove with a slotted spoon and remove skin. Cut into 1/4" slices and set aside. In the bowl of a stand mixer fitted with the paddle attachment add your butter, sugars, salt and flour to make your pastry shell. Mix until a soft dough forms, it may be a bit crumbly. Remove from bowl and wrap in plastic wrap, place in fridge. Combine your milk, heavy cream and egg yolks in a bowl, whisk until combined. In a medium-sized pot, add your sugar and cornstarch over medium heat. Slowly add in about 1/2 cup of your milk/egg mixture and whisk until smooth. Once smooth and combined, slowly add your remaining milk/egg mixture and continue to whisk on medium heat until the mixture thickens. Once thick, remove from heat add your vanilla and salt. Whisk until combined. Pour mixture into a bowl and cover with saran wrap, be sure the wrap touches the top of your pastry cream so a film doesn't form. Place in fridge. Remove dough from fridge and roll into a large circle to fit your prepared tart pan. If your dough is still a bit soft, just place pieces of dough in pan and press together. Press your dough into the pan. Using the bottom of a smooth glass, go around and be sure the edges of the dough are pressed into the sides evenly. Also go around the bottom of the crust to ensure it is even all the way around. Bake tart shell for 15 minutes empty. Pour your pastry cream into par-baked shell, it should fill your shell almost to the top. Begin layering your sliced peaches in a circular fashion. 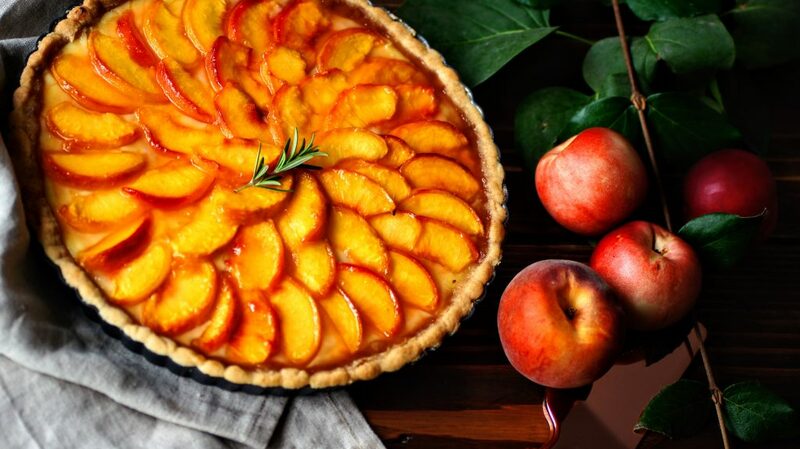 Sprinkle your raw cane sugar over the peaches and bake for 40-45 minutes. Microwave your apricot jam and water for about 30 seconds. Brush the mixture onto the hot tart once cooked through. Let cool, remove outer ring of tart pan and enjoy! **If your peaches are very ripe, they will take much less time to peel, just watch as you place them in the water. 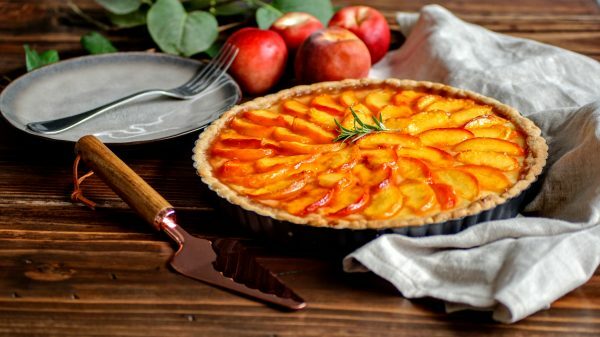 **Store tart in fridge up to 3 days.